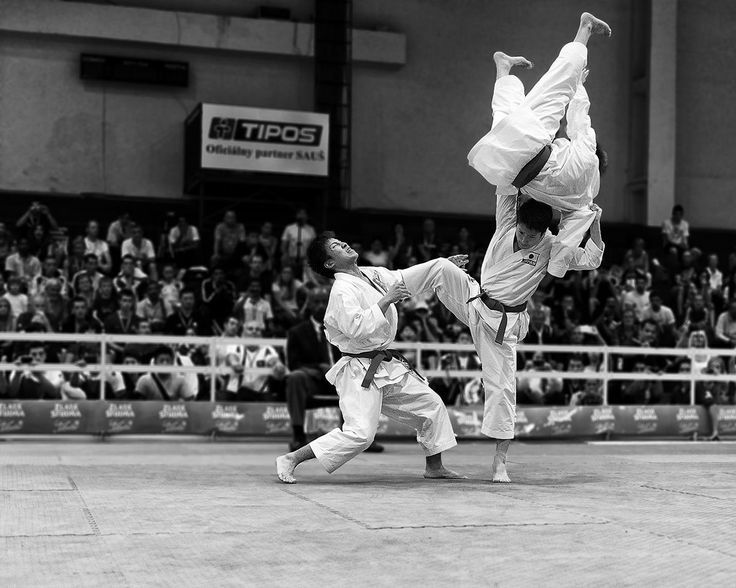 Kata have been used by karate masters over the years for many reasons, e.g. to aggregate and help with the transfer of knowledge to their students, to help with training, conditioning, etc. But it is thought that when karate made it into the Okinawan schooling system thanks to Anko Itosu (and later onto the Japanese shores through Funakoshi), katas were systematically sanitised, with “dangerous” techniques hidden or removed altogether. Bunkai aims at deciphering the kata to identify these “hidden” techniques (chokes, arm locks, throws, etc.) or in other words, it is the process by which a kata is analysed and decomposed to extract useful fighting techniques (oyo, 応用). It is usually performed by a student who will use the selected kata (or katas) to respond to predefined attacks from other students. As techniques in a given kata may be used in different situations, there might many ways to interpret a given sequence. In fact the bunkai may be obvious depending on the technique (or techniques) being analysed, the moves preceding and following it, and the level of maturity of the student, the sensei’s willingness to share his knowledge, etc. Therefore there are usually several stages a student, under the guidance of his sensei, will follow depending on his level of experience, the sensei, the kata, etc. – Omote (表): In Japanese, omote means “surface”. Therefore omote bunkai are simple and direct. “What you see is what you get”, i.e. if a technique looks like a block, then it must be a block (not a joint lock, throw, strike or wrist release). In other words, every technique is taken at face value. This is a simplest way to interpret kata but the downside (that becomes apparent pretty quickly) is that it often relies on unrealistic scenarios. – Ura (裏): The second way of interpreting kata is known as ura bunkai. In Japanese, ura literally means “behind”. Hence, the concept of ura bunkai implies to hidden or advanced techniques. In other words, things might not be not as they immediately look like: if it looks like a block, it could be something entirely different! To an extent, this interpretation is consistent with the fact that many old and dangerous techniques were removed or hidden within the kata. Therefore, although a kata might look very simplistic in its nature, it could actually have some very advanced application(s) hidden inside it. – There is only one opponent and he is in front of you. – This is one set of rules but many more exist!